By the time you read this, elections to the Northern Ireland assembly will have taken place and a power-sharing executive may (or may not) have been formed. My hunch is that it will, but in saying so I am conscious of the ghost of the editor of the Chicago Daily Tribune, who infamously jumped the gun in the US presidential election of 1948 and ran with the headline DEWEY DEFEATS TRUMAN. If indeed a power-sharing executive is formed (and if it is not formed now it surely will be in the near future), few would disagree that this will represent a major watershed in the history of this island, ‘an honourable compromise’ in the words of President McAleese, quoted by Walter Forde in the piece opposite. 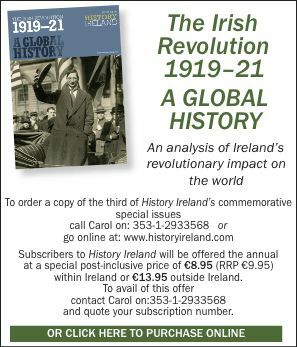 For historians (and for History Ireland) this presents the challenge of summing up the recent conflict, of assessing and analysing it. What is (was?) politics can now pass into the realm of history. A coincidental but significant backdrop to these developments was the opening up of Croke Park to ‘foreign’ games, and the rugby match against England in particular, in the same venue as the infamous events of Sunday 21 November 1920. At the same time the old mind-sets have not gone away. Outside the ground a young protester (in a Glasgow Celtic jersey!) carried a placard saying ‘NO TO FOREIGN GAMES’, and in the same week a DUP counciller, a former Irish rugby international, refused to canvass for his party because of the prospect of a deal with Sinn Féin. And yet, judging by the low-key and lacklustre nature of the election campaign in the North, it seems that all this will come to pass with a whimper rather than a bang. Is the political scene in Northern Ireland becoming banal? Let’s hope so.